Powerex Medical Products | Lewis Systems Inc. Designed to provide medical breathing air for hospital and medical institutes. 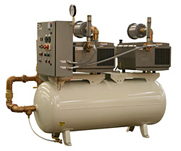 All systems meet NFPA 99 requirements for Level 1 breathing air.